McBride is also a precinct committeeman for the McLean County Democrat Party. It’s his job to get people in his precinct to the polls to vote! Who is he telling them to vote for? Notice anything about the stories they cover? Any conservative voices? WGLT is PUBLIC RADIO located on the campus of Illinois State University. Yes folks, fake news does exist. Search WGLT.org for Mike Madigan – it’s been awhile since his name was mentioned in a story. Of course none of the stories blame him for destroying Illinois. WGLT did do some stories on non-profits haven’t trouble helping people. The STATE is to blame, not the guy blocking reforms, passing budgets that spend more money than the state takes in, and tax increases. It sounds just like the local government! Yes, it’s the State’s fault. Since ISU and WGLT are directly affected, that should be news. Maybe today. Side note to local Republicans: You are losing local elections because you can’t fill precinct committeeman slots. Every precinct on the Democrat website is filled. It might help if you took a stand on something, anything! McLean County is already in big trouble with Madigan wannabes running both cities. The local GOP is doing nothing to stop the decline. Start by kicking liberals out of the party! Posted in - - - Please Contribute - - -, BloNo, Bloomington, elections, Liberal Media, Local, McLean County, Normal, Progressives, State, Taxes.Tagged GOP, Illinois Policy Institute, Illinois State University, IPI, ISU, local Republicans, Mike Madigan, RC McBride, TOWN OF NORMAL, WGLT. WJBC went down hill 10 years ago. They seemed to have embarked on advocate based journalism. 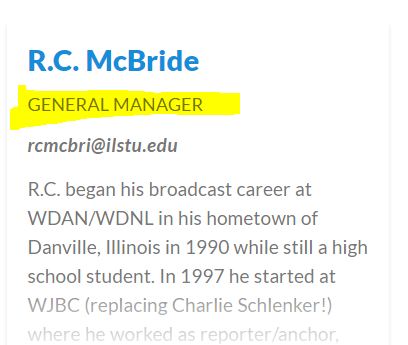 That would be advocating for left wing spin while pretending to be the voice of McLean County. All the people want is fair and balanced objective journalism. JUST the NEWS, no “spin doctors” and WGLT puts so much tilt on the “news” it’s sickening by the time they get done with it. They USED to be a good station, when they just SHUT UP and played jazz and blues, maybe they SHOULD go back to that format and leave the babble to others! Followed you link to The McLean County Democrat website–a long list of Marxists, union thugs, and pot heads (and, I guess, some good people). Let’s get serious–are you a business owner who employs any of these people? FIRE THEM! I guarantee as a capitalist and participant in the market economy, they absolutely hate you. Why keep a “snake in the nest”? GET RID OF THEM, let them sponge off the government (even more). Boyd not Boyle. Boyd was also the guy defending the bike lanes on E Washington on Facebook. Mike McCurdy, Vice President of Bike Blono is WGLT’s program director. The deck is stacked and the fix is in. Diane, thanks for correcting me. The County Board member, Rosilini (sp?) was in the same conversation. I suppose he was there because he represents downtown. Robustelli. Also a Democrat and Renner frequent free lunch partner. How do we fill the Precinct Committeemen slots? And does every precinct in both towns have a slot for Repub and a Dem? Truly not clear on how that works. Thx !! Each party sets their own precinct. If you have no idea who yours is, he/she isn’t doing their job or its vacant. It’s actually an elected position. WOW! So much cronyism. I had to do a report in High School for my Sociology class on big city politics and political machines. Boss Tweed, Pendergast, Dailey, Huey Long, and NONE of these guys hold a candle to the BS that ole Tari is getting away with. Wonder IF ole Tari is like Huey Long and a “good ole boy” in sheeps clothing. Only the Grand Imperial Wizard of the Invisible Empire knows for sure!! Right Tari??? Wear WHITE at night and stay in sight! Good rule for bike Blo-no!! Don’t forget a couple of years ago Normal agreed to provide up to $500,000 to Illinois State University to help pay for the video scoreboard on the football field. This was to be paid $100,000 per year for 5 years. This via a council vote….no conflict of interest here. As a bigly conservative, I’ll be voting for the yuge successful businessman JB Pritzker for Governor next year. His support for legalizing Marijuana will create so many jobs and I would love to get in on the profits like all the millionaires in Colorado have.